Upma is a type of preperation belongs to south Indian cuisine. In the preperation, there are certain Indian spices are used. Upma can be made with Poha or rice flakes, Semiya or vermicelli, Suji, Oats flakes and so on. Upma is made usually for breakfast and it's a little spicy preperation. Upma is very common in my household and specially I love it. Usually I make it with suji, but this time I tried it with rice flakes for a change. You can add all sorts of vegetables(carrot, beans, cauliflower, capsicum, green peas etc.) to the upma to make it more healthier and filling. Mustard seeds : 2 tsp. Curry leaves : 10-12 nos. Chana Dal : 1 tsp. Urad dal : 1 tsp. Wash poha and then soak in little water for 2 minutes, then drain the whole water and keep aside. 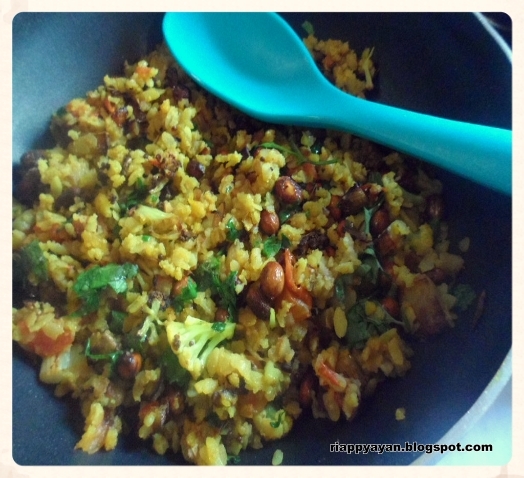 Otherwise poha will be very soggy. Heat 1 tblsp. oil in a pan, add vegetables and saute till done, keep aside. In the same pan, fry raw peanuts in little oil until brown and keep aside. In the same pan, add 1 tblsp. oil and heat. Then temper it with two types of dal first, then add mustard seed and curry leaves. When seeds crackle and you get the aroma of curry leaves, add onions immediately, saute till they change color. Then add chopped green chillies, ginger and tomatoes. When tomatoes softens, add turmeric powder and red chilli powder. 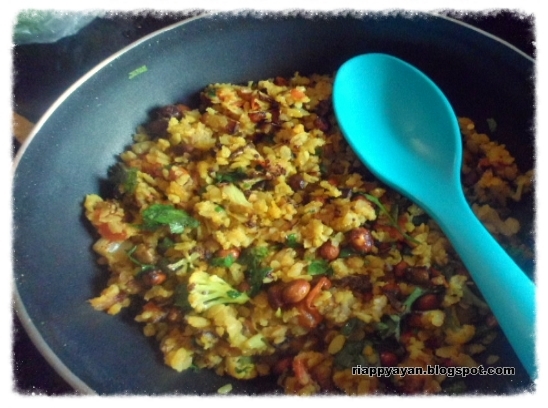 Add soaked poha, vegetables and fried peanuts. Mix everything well, season with salt and 1 tsp. sugar to balance the taste. Stir fry for another 2-3 minutes. Remove from heat and don't forget to garnish it with fresh coriander leaves. It gives a special touch to this dish. A completely meal,lovely upma,my kind of food. Very tasty and yummy upma. I make exactly the same way only don't add urad dal...Looks inviting..
Indrani onek din tomake dekhina..Esho shomoye pele..